Catastrophic Failure – Who is paying the price for BHP’s mine disaster in Brazil? A tailings dam, holding back more than 50 million cubic metres of mining waste collapsed, unleashing a wave of mud several metres high. The waste in the dam came from the huge open cut Samarco iron ore mine, half owned by Australia’s BHP Billiton. 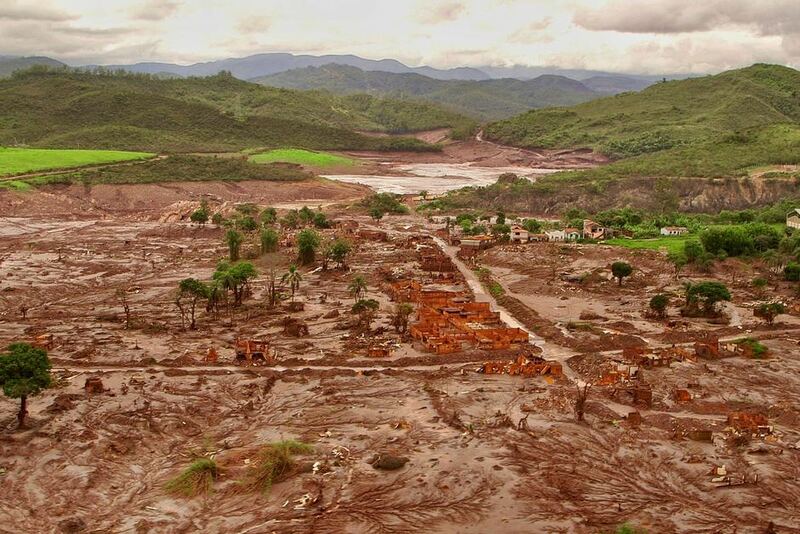 Brazil’s chief environment officer calls it the biggest environmental disaster in the country’s mining history. Reporter Ben Knight arrived in Brazil within days of the dam collapse as the search for victims continued in atrocious conditions. Now in his first report for Four Corners, he returns to Brazil to investigate whether multiple warning signs were ignored. What he finds is a catalogue of failure, where even the emergency alert system didn’t work. BHP has distanced itself from the operations of the mine, but the company’s bottom line has taken a hit. This week BHP announced a $US5.7 billion half year loss, writing off more than a billion dollars due to the dam disaster. Unlike PNG, China has put a law in place to regulate Experimental Seabed Mining BEFORE licensing any operations – common sense really! On Friday, China passed the country’s first law on deep seafloor mining. The law is designed to protect the maritime environment and ensure sustainable exploitation of its mineral resources. Xinhua reports that the law stipulates that exploration and development should be peaceful and cooperative, in addition to protecting the maritime environment and safeguarding the common interests of mankind. Prospectors must submit their plans to a Chinese maritime watchdog and must include environmental impact assessments in those plans. Only after the regulator approves the plans can application be made to the International Seabed Authority. Deep sea project operators must have an emergency response mechanism and report immediately to authorities if an emergency occurs. 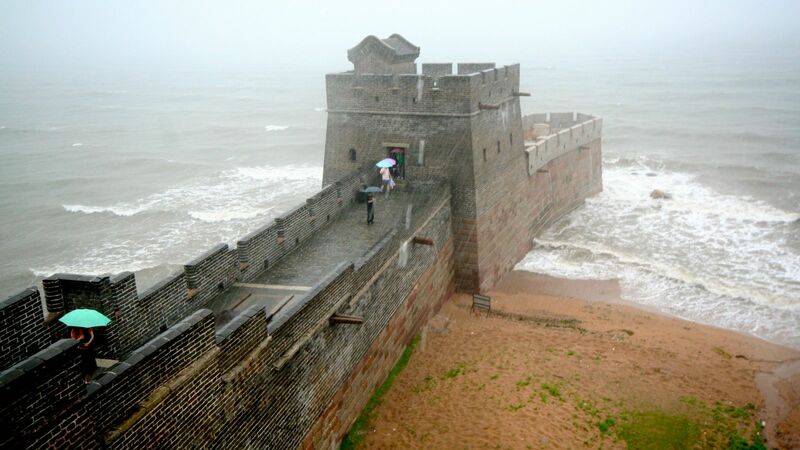 If their activities result in pollution, they can be fined up to one million yuan ($153,000). Operators are also required to take measures to preserve maritime ecosystems and biodiversity. The new legislation will come into force on May 1, and it also mandates the government to formulate plans and promote research and surveys of resources. Wanpla save meri blong Bougainville i mekim bikpla askim igo long Autonomous Bougainville Gavman long tokim gut ol pipal long ol mining Loa em oli bin kamapim long 2015. Dr Ruth Spriggs, wanpla meri blong Bougainville iet husat isave lukluk long ol wok kamap na sidaon blong ol pipal blong Bougainville i mekim despla askim long wonem emi tok despla mining law i havim tasol ABG na ol mining kampani. 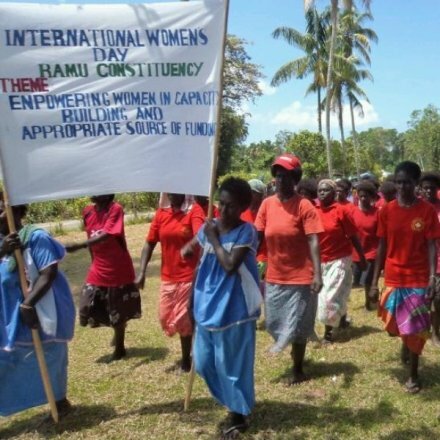 Emi tok despla loa bai nap kamapim narapla bikpla heve olsem Bougainville Crisis em planti tausan pipal ibin dai long en. Bikpla fait ibin kamap long Bougainville long ol yia 1980’s long wonem ol papa graon klostu long Panguna Copper mine ibin gat kros wantem Mine na PNG Gavman. Dr Spriggs itok, emi wari long wonem aninit long ol loa, gavman inap sasim ol papa graon samting olsem K20 tausan kina na kalabus inap long wanpla yia sopos oli brukim ol despla mining loa. Veronica is based in Port Moresby and has worked for a long time as senior reporter for Word Publishing’s Wantok newspaper. 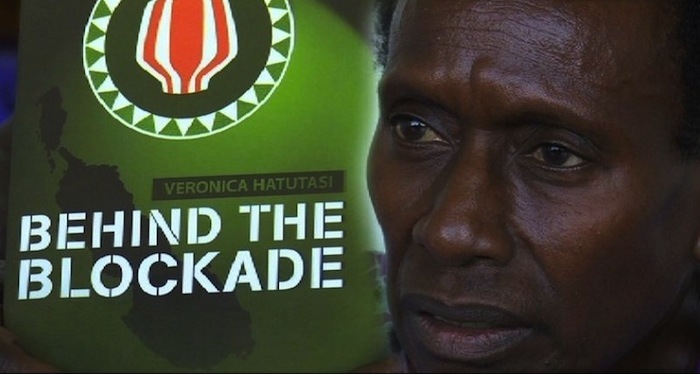 Now chief reporter with the Wantok newspaper, it’s taken Veronica Hatutasi a long time to get her book published. LANDOWNERS are threatening to close down the Tolukuma gold mine in Central Province if the developer, Asi Dokona, fails to enforce the memorandum of agreement signed last year. The MOA was between the Asi Dokona, the state and the landowners. Yulai Landowner Association chairman George Gusi said yesterday they were forced to take this stance as numerous attempts by the landowners for a round table with them (the developer) had fallen on deaf ears. Business spin offs, environmental issues and social and community issues were some of the issues that Mr Gusi says they had wanted to discuss. “Up until today the developer hasn’t been working with the people. We are urging a round table to discuss these issues and how they intend on addressing them,” Mr Gusi said. He said local landowners in the area had suffered for more than 20 years since the establishment of the mine and did not want the same woes to be repeated with the new developer. “Our concern is for the developer to include us in the spin off businesses and have us captured in the operation of the mine so that the people are not left out,” Mr Gusi said. He said one way effective was to offload contracts to the landowner company who would then partner through joint venture agreement with other reputable companies adding that would be one way landowners are given full participation. 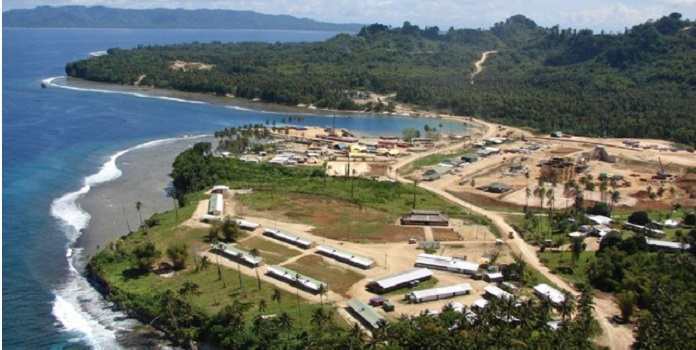 He said there needed to be close consultation with the developer to find better ways to dispose of tailings from the mine affecting the livelihood of the people living along the Auga River and the Kairuku Hiri people living along the Angabanga river. The chairman echoed the same statements by Minister for Petroleum Ben Micah to work in partnership to achieve results and people are satisfied. Has the Treasurer signed off on PNG’s EITI report? 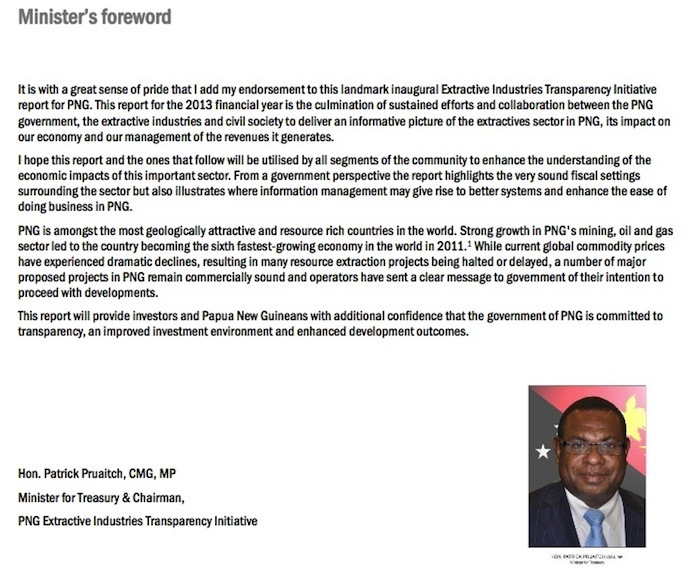 PNG’s first Extractive Industries Transparency Initiative Report has been published but the signature of Patrick Pruaitch, the Treasury Minister and Chairman of PNG EITI, is noticeably missing. Why has the Minister not signed? In the interests of TRANSPARENCY can someone give us an honest explanation? Gold miner St Barbara has launched a strategic review of its Simberi operations, in Papua New Guinea, which would evaluate “various options” for the assets, including continued ownership, exploration and development, possible joint ventures and divestment of some or all of its assets in the country. 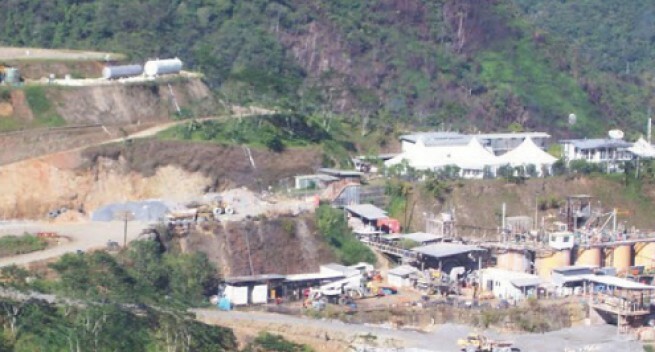 St Barbara this week pointed out that the Simberi operation produced 107 553 oz of gold during the 2015 calendar year, with production for 2016 forecast at between 100 000 oz and 110 000 oz. The ASX-listed company was currently conducting a prefeasibility study into a sulphide project at Simberi, which could extend the existing oxide mine life by about three years by producing an additional one-million ounces of gold-in-concentrate over a further seven-year period. The proposed sulphide project would use the existing infrastructure at Simberi, but would require a capital investment of about $100-million, with funds partly going towards a new mining fleet. The prefeasibility study was due for completion in April. To avoid any interruption in production, St Barbara was expected to make a decision on the sulphide project later this year. The company, meanwhile, reported a statutory profit after tax of A$77-million for the half-year ended December, which was significantly up from the statutory loss of A$19.8-million reported in the previous corresponding period. Revenue for the interim period was up from the A$236.5-million reported in the six months to December 2014, to A$311.6-million, as total production for the same period increased from 166 741 oz to 202 951 oz of gold. Gold sales also increased from the 166 960 oz sold in the previous corresponding period, to 198 826 oz. Consolidated all-in sustaining costs for the period declined from A$1 166/oz to A$922/oz, reflecting the benefits of strong gold production at the Gwalia mine, as well as improved performance from Simberi.